We’re already celebrating Easter here in our house. We love all the things that this favorite Spring holiday brings. We’re also trying a few new things this year. Easter Egg Hunt Idea: We always hunt Easter eggs several weeks leading up to the actual holiday. My boys love to grab their pails and race to see who can collect the most eggs. That’s fun and all, until someone is left out because older brother is faster and collected them all. I have the perfect solution for that! Starting this year, the boys are going to get a colored pail and the new directions include only picking up your designated color egg. So, if you’re carrying a yellow pail, you can only pick up the yellow eggs. If you have a blue pail, you’re only able to pick up the blue eggs. I love this idea because it leaves enough for everyone to fill their pails with eggs. That way everyone is happy! 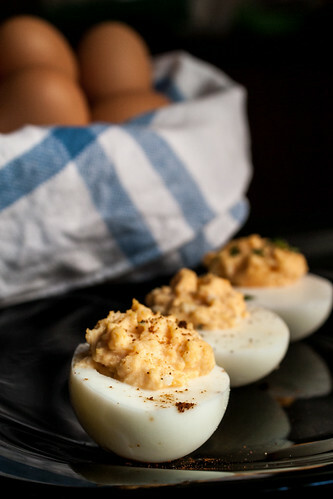 The Best Deviled Egg Recipe: Deviled eggs are one of my favorite things to eat on Easter Sunday. Not sure what it is, but I HAVE to have them for Easter dinner. Here is my favorite recipe. 1. Place eggs in saucepan and cover with water. Let it boil. Cover, then remove from heat, and let eggs sit in hot water for 10-12 minutes. Remove from water and cool. 2. Peel & cut in half lengthwise. Remove the yolk and combine with mustard, mayonnaise, and salt and pepper. Mix together real well until smooth. 3. Refill each egg half with the yolk mixture and garnish with paprika. One of the books we’re reading this Spring is An Easter Prayer, written by Amy Parker. This is the perfect book for preschoolers. In this book, little ones learn they have much to thank God for when spring arrives. But the most important thing is JESUS! I encourage you to check this book out at the library or purchase it for your little preschooler to read. It will quickly become an Easter tradition. This entry was posted in Tommy Nelson and tagged Meghan Tucker by Tommy Nelson. Bookmark the permalink.